It was a great day for the Juventus fans as they cheer the five times Balloon d'Or winner Cristiano Ronaldo, as he scored his first goal the fans in unison chants "Ronaldo bring us the champions League". 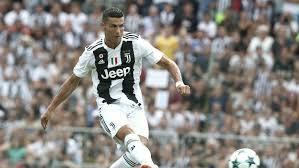 Ronaldo joined Juventus from Real Madrid at a £99.2m deal in July, he began pre-season training on 30'th of July, he scored the first goal of the match for Juventus against Juventus B the junior Juventus team in the annual friendlies between the senior team and the junior team. Ronaldo scored at the eight minutes of the game as he beats goalkeeper Leonardo Loria, in the 10'th minutes of the game he also forced an own goal from Riccardo Capellini. Paulo Dyhala scored two goals in the 31st and 40th minutes while Claudio Marchisio scored in 53rd minutes to seal the scoring for the first team making it 5-0. The game ended in the 72nd minutes due to invasion from nearly 5,000 fans. Main while Leonardo Bonucci, who returned to Juventus from AC Milan two weeks ago and Emre Can, who joined from Liverpool all started the game. Ronaldo is set to make his official appearance for Juventus on Saturday at Chievo Verona as they open their serie A campaign. As Ronaldo joined the team this summer in a 99.2m deal the club and the fans confidently believes the Portuguese will help the club win champions league trophy and more trophies.